After Retirement the P72s & P75s were scattered nation wide. Was there a disposition sheet? Anyone know of all locations? What cars were scrapped/ modified? Last edited by deandremouse on Sun Jun 14, 2009 8:51 pm, edited 1 time in total. What you talking about? Lots of P72-75 or whatever were turned into garbage cans. The farthest away I've seen them is in Florida. not quite as a constructive answer as you normally post. This person was looking for some info. These cars were bought in bulk many years ago and scattered around the US and most of them (2700-2900 series) are actually still in tourist service. Granted, a LOT of them were scrapped, but the majority are still turning a wheel. Maybe someone in the "know" can provide deandremouse with an better answer. We have 2705, 2929, and 2795 on the Blue Ridge Scenic RR. 2705 is still in its original configuration (although we removed 1/2 the seats to make more room for passengers), while 2929 and 2975 were converted to open-air coaches by removing the side windows/seats, and installing bench seats for the passengers. Yeah, I was tired last night, so I really wasn't in the mood to post the info I know. I figured as much. What info can you give us? I've seen some as far west as Alamosa, CO before, I'm sure a few made it out to California too. It has been almost 10 years (1999) since the C-3 bilevels first arrived and the MP72/75s removed from diesel service. 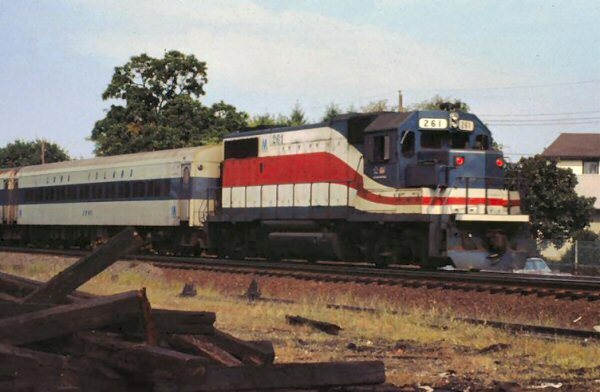 One interesting thing about the MP72/75s is thrir design-it appears the 1970 Erie Lackawanna Comet I cars are similar. Both were built by Pullman and I wouldn't be surprised if the Comet I was derived from the MP72/75 design. I don't really have alot of good data. I know one was turned into a chapel, but I don't really have good info on where alot went. There are still quite a few stored in original condition (with the addition of grafitti galore) in the Waldorf, Maryland area. There are six visible on a siding on the western side of Route 301 in White Plains (just south of Waldorf), and about 30 (or so) at last check on a few spurs east of Route 301 just north of Route 228/Route 5 intersection (just east of the WalMart, behind the big Cheney Enterprises site). Not sure if there are any plans to restore/sell/scrap them, but they've been sitting idle for quite a few years now. There was supposed to be a dinner train on the Indian Head Railroad trackage, and I think some of these old coaches were penciled in for that, but those plans died a few years ago. I saw a post on Trainorders recently with photos I think was about these 6 cars. The plan is to scrap them, as they are all in bad shape. MadManMoon wrote: There are still quite a few stored in original condition (with the addition of grafitti galore) in the Waldorf, Maryland area. There are six visible on a siding on the western side of Route 301 in White Plains (just south of Waldorf), and about 30 (or so) at last check on a few spurs east of Route 301 just north of Route 228/Route 5 intersection (just east of the WalMart, behind the big Cheney Enterprises site). R36 Combine Coach wrote: It has been almost 10 years (1999) since the C-3 bilevels first arrived and the MP72/75s removed from diesel service. One interesting thing about the MP72/75s is thrir design-it appears the 1970 Erie Lackawanna Comet I cars are similar. Both were built by Pullman and I wouldn't be surprised if the Comet I was derived from the MP72/75 design. In what way were they Comet I's similar to P-72s or MP-75s? The Comets had inboard-bearing Pioneer III type trucks with ASF unit tread brakes, like the M-1s/M-3s. They had low-level power operated doors to serve low-level platforms only. The engineer's seat and windshield were also low compared with standard cab cars. They had two flourescent lighting strips, each one next to one of the widely separated air conditioning slots, as opposed to the LIRR cars' center-of-the-ceiling flourescent light fixture and air conditioning vents located on either side of it. They were designed for 480 v.a.c HEP. Also, you really can't group the LIRR's 72s and 75s together as they were quite different from one another. P-72's and 75's are the new Boonton coaches, everyone has one and there usually rotting to bits.